Pips are small but easily countable items, such as the dots on dominoes and dice, or the symbols on a playing card that denote its suit and value. Dominoes use pips that are similar to dice. Each half of a domino tile can have anywhere from no pips all the way up to six or nine pips (depending on countries) arranged in the same manner to dice pips. Regardless of dominoes having up to six or up to nine pips on one half of the tile, the game is generally played for up to four players only, individually or in partners (pairs). The Nine of Clubs with nine pips and two corner index pips. 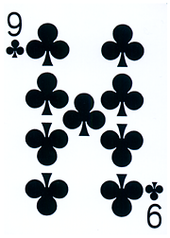 In playing cards, pips are small symbols on the front side of the cards that determine the suit of the card and its rank. For example, a standard 52-card deck consists of four suits of thirteen cards each: spades, hearts, clubs, and diamonds. Each suit contains three face cards – the jack, queen, and king. The remaining ten cards are called pip cards and are numbered from one to ten. (The "one" is almost always changed to "ace" and often is the highest card in many games, followed by the face cards.) Each pip card consists of an encoding in the top left-hand corner (and, because the card is also inverted upon itself, the lower right-hand corner) which tells the card-holder the value of the card. In Europe, it is more common to have corner indices on all four corners which lets left-handed players fan their cards more comfortably. The center of the card contains pips representing the suit. The number of pips corresponds with the number of the card, and the arrangement of the pips is generally the same from deck to deck. Look up pip in Wiktionary, the free dictionary. This page was last edited on 25 March 2019, at 08:26 (UTC).